Fayette County Sheriff’s Miami Trace Campus Safety Officer Adam Greenlee. One Fayette County Sheriff’s Office deputy will return the Drug Abuse Resistance Education (D.A.R.E.) 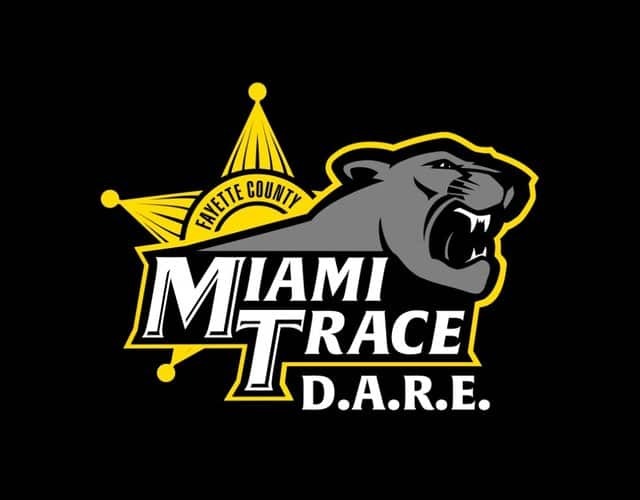 program to Miami Trace Local Schools while also serving as full-time campus safety officer. Campus safety officer Adam Greenlee will begin teaching fifth grade students the D.A.R.E. program on Monday. According to the Ohio D.A.R.E. website, the D.A.R.E. program is an internationally-recognized, model program created in 1983 by the Los Angeles Police Department and the Los Angeles Unified School District. D.A.R.E. provides students from kindergarten through high school with the skills necessary to recognize and resist pressures to experiment with drugs and to avoid gangs and violence. Lessons emphasize self-esteem, decision-making, interpersonal communications skills, the consequences of drug abuse, conflict resolution and positive alternatives to substance abuse. According to Stanforth, the Miami Trace Local School District contracted with them for a campus safety officer (CSO) and that had became an assignment for the day shift patrol. Officers would be rotated out of the patrol unit to handle the campus area of Miami Trace for their shift. Stanforth said that upwards of 1,500 people or more can be in that area every day and that it needs to be covered. That was a temporary set-up, as throughout that time Stanforth said they were looking for someone who was qualified and interested to take over the D.A.R.E. program. Stanforth said that Greenlee approached him and FCSO Chief Deputy Andy Bivens late last school year. He seemed interested and willing to take the qualification steps necessary. Greenlee said that he is originally from the county, his grandmother carried mail for the Washington Court House Post Office for 32 years, and his grandfather was a local farmer who is now retired. He is married to his wife Rachael and has a 3-year-old son named Gabriel. He said he went to Miami Trace until his sophomore year and then moved to Rogersville, Ala., where he graduated from Lauderdale County. He decided to return and joined the Fayette County Sheriff’s Office where he has been for about three years now. Greenlee said the D.A.R.E. program has changed in recent years. The change moved toward a D.A.R.E. curriculum and that it is no longer just about saying no to drugs and violence, it is about teaching the kids life skills. It helps them in how to identify and healthy ways to cope with stress, peer pressure, bullying and the difference between tattling, telling and reporting, as well as other life skills in general. According to Greenlee, the D.A.R.E. curriculum is based in science and has several “Ph.Ds” that helped to write it. https://www.recordherald.com/wp-content/uploads/sites/27/2016/09/web1_Greenlee-1.jpgFayette County Sheriff’s Miami Trace Campus Safety Officer Adam Greenlee.